The 3/8 oz. 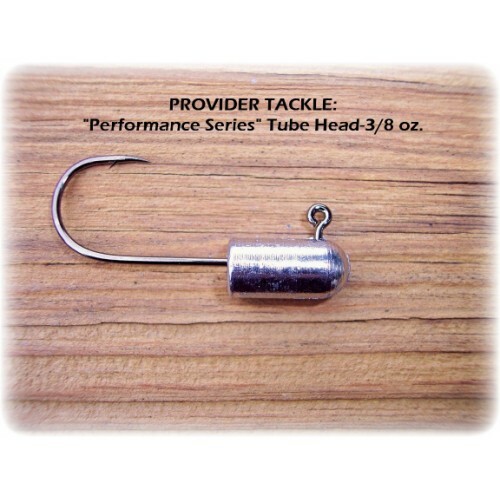 tube head is a favorite to most current fisherman and Great Lake "draggers". This is a very well balanced head that will get you over most cover and keep you feeling it along the way. Art has designed a head that he feels is going to be a real compliment to your tube fishing. These heads are thrown by many of the top pros and locals on the Great Lakes. Total tournament winnings with these heads is in the hundreds of thousands of dollars. The head is designed with perfect precision fit towards the front of the tube to give you better control of the bait. It is designed with offset weight toward the bottom of the head for perfect swimming action. This causes less line tangles in your reels. Finally, the Performance Series tube heads have 2/0 Owner hooks on 1/8-1/4oz. and 3/0 Owner hooks on 3/8-3/4oz.. These hooks are STRONG. With a "hooked" barb, you'll find better hook ups. Lower profile hooks are used for the benefit of cutting through grass better and less hang ups on rocks.